FIREFIGHTER-EMT & FIREFIGHTER-EMT-P - The Kearney Fire and Rescue Protection District is accepting applications for full-time Firefighter-EMT and/or Firefighter-Paramedic (EMT-P). We have one immediate opening and will establish an eligibility list for a minimum of the next 12 months or until the list is exhausted. Applicants must be eighteen years of age, high school graduate or equivalent, and possess a Missouri State Vehicle Operators License, Missouri State EMT or EMT-P License and be FFI & II certified. Applicant should be... Click here to read more. Congratulations to the winners of the Kearney Chamber of Commerce Winter Window Decorating Contest! Winners and Prizes are as follows: 1st Place - Kearney Fire & Rescue Protection District Click here to read more. The usage and discharge of fireworks are strictly prohibited in many greater Kansas City communities, however some communities do allow the discharge of certain class "C" fireworks. If your community allows for the discharge of fireworks, the Heart of America Metro Fire Chiefs Council offer the following safety tips: Click here to read more. The company is aware of one death when emergency responders couldnï¿½t get the recalled extinguishers to work. There have been almost 400 reports of problems related to these Kidde fire extinguishers. Check the U.S. Consumer Product Safety Commissionï¿½s website for information on specific model numbers involved with this recall. Kidde will replace recalled extinguishers for free. Click here to read more. A public hearing will be held at 6:30 P.M., August 21, 2017 at the Kearney Fire Station at which time citizens may be heard on the property tax rates proposed to be set by the Kearney Fire and Rescue Protection District, a political subdivision. Click here to read more. The Kearney Fire & Rescue Protection District is pleased to announce effective May 1, 2017, they have achieved a Class 3 rating from the ISO Public Protection Classification (PPC) program. Of approximately 46,000 rated fire departments in the United States, less than 5,000 or 10.8% are rated Class 3 or better, of the 1,740 in the state of Missouri, 123 or 7% are Class 3 or better. Click here to read more. The Kearney Fire & Rescue Protection District responded to 1,767 incidents in 2016, which surpassed our record breaking year in 2015. This was a 7.5% increase from 2015. 10.1% of the calls for the year were overlapping. Click here to read more. The Kearney Fire and Rescue Protection District has hired a new Fire Chief. Kevin Pratt will assume the duties effective January 1, 2017. Pratt began his career with the District as a volunteer in 1986. In 1991 he was hired as one of the first career firefighters for the District. He progressed through the ranks to Lieutenant in 1998, shift captain in 2005, and deputy chief in 2008. He completed his Associate Degree in Fire Science in 2006. He is a member of the Internantional Association of Fire Chiefs, serves as the co-chair of the Heart of America Fire Chiefs professional development committee, is a board member of the Northland Fire Chiefs Council, and is a board member of the Mid-America Regional Council Emergency Response Committee. During his career he has received five life saving certificates from the Firefighters Association of Missouri. Click here to read more. Chief Larry E. Pratt has announced his retirement at the end of this year from the Kearney Fire and Rescue Protection District. The Board of Directors has begun the process to select his successor. Larry's service began with the Kearney Volunteer Fire Department as a junior firefighter in 1963. He was one of approximately a half dozen students who were dismissed from Kearney High School to respond on calls during his high school career due to a lack of manpower in the mid 1960's. Click here to read more. KANSAS CITY, Mo. (March 18, 2016) ï¿½ Janet Andes was up early the morning of July 12, 2015 drinking coffee and reading the newspaper while her husband slept. She stood up from the table and realized something was terribly wrong. She could not move her left side. She fell to the floor. Andes' fall awakened her husband, who found her on the floor with a droop on the left side of her face, as well as weakness in her left side and a left gaze. When she tried to answer his questions, her speech was garbled. He called 911 and EMT Kent Youngblood along with paramedics Steve Giacone and Keith Keplinger, as well as Captain Robert Looper from Kearney Fire and EMS arrived within minutes to assess Andes. The team recognized Andes was having a stroke. Knowing that time equals brain cells lost during a stroke, they quickly stabilized and transferred her to Saint Luke's Marion Bloch Neuroscience Institute at Saint Luke's Hospital of Kansas City. En route the team communicated with the Saint Luke's stroke team so they could prepare for Andes' arrival. Click here to read more. 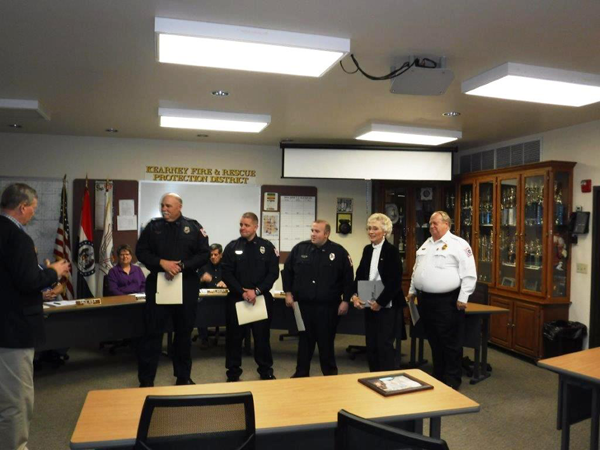 Adopted by the Kearney Fire and Rescue Protection District Board of Directors on March 21, 2016. All fees will be collected at Kearney Fire & Rescue, 201 East 6th Street, Kearney, MO 64060. Click here to read more. The Kearney Fire and Rescue Protection District responded to 1,644 incidents in 2015, making this our record breaking year. This was a 7.2% increase from 2014, which was our previous breaking year. 10.4 of the calls for the year were overlapping. Click here to read more. Brycer, LLC is pleased to announce that the Kearney Fire & Rescue Protection District has entered into an agreement with The Compliance Engine (TCE), a proactive compliance solution application and service. The Compliance Engine will help the Kearney Fire & Rescue Protection District reduce their time spent in administering fire code requirements, increase their ability to enforce and verify compliant fire protection systems, and strengthen the protection for its citizens and visitors. Click here to read more. The Kearney Fire & Rescue Protection District was recently presented with a Life Safety Achievement Award for its fire prevention accomplishments in 2014 by the National Association of State Fire Marshals (NASFM) Fire Research and Education Foundation in partnership with Grinnell Mutual Reinsurance Company. The award was announced by H. Butch Browning, President of the NASFM Fire Research and Education Foundation. Click here to read more. KANSAS CITY, Mo. (May 13, 2015) ï¿½ July 2, 2014 began as usual for Linda Smith of Kearney, before taking a dramatic turn for the worse during breakfast. Her husband first noticed 54 year-old Linda's slurred speech, then the left side facial droop, and weakness on her left side. Thinking quickly, he called 9-1-1 and Kearney Fire and EMS responded within minutes. Paramedic Rod Barnhart and EMT Luke Pierce immediately identified Linda's symptoms as stroke. Understanding that seconds mean brain cells lost during a stroke, they stabilized her and quickly transported Linda directly to Saint Luke's Hospital of Kansas City, a nationally recognized Comprehensive Stroke Center capable of treating the most complex strokes. En route to Saint Luke's, the Kearney Fire and EMS team contacted the Saint Luke's stroke team, and upon arrival Linda was immediately evaluated and categorized as a moderate to severe stroke. Thanks to Barnhart's and Pierce's quick thinking, she arrived quickly enough to receive tissue plasminogen activator, or tPA, also known as the ï¿½clot busting drug.ï¿½ tPA only may be administered within a specific window of time after onset of a stroke. Neuro interventionalists at Saint Luke's Marion Bloch Neuroscience Institute removed her clot, and within a few days, Linda showed dramatic improvement and was discharged to short-term rehabilitation for extremity strengthening. Click here to read more. The Board of Directors of the Kearney Fire and Rescue Protection District is pleased to announce the promotion and appointment of Firefighter-EMT Jeff Fort to the career position of Fire Marshal. Jeff will begin his duties March 1, 2015. Click here to read more. Retired Assistant Chief Jim Barger passed away on January 1, 2015, from complications of pneumonia. Jim joined the Kearney Volunteer Fire Department (which was a city department with rural memberships outside the city limits), May 1, 1972 as a firefighter. He was one of the first three EMT's for the department that completed their training in one of the first field EMT classes in 1973, and was elected to Assistant Chief in 1975. He began participating at the State Fair Fire Department in the mid 1970's serving in many positions including Chief. In 1981, a successful bond issue was passed in Kearney to build a new station and purchase a new pumper. Jim was one of the volunteers that spent a lot of hours in the construction of the station, as well as the maintenance of the equipment. He attended numerous training classes including the first Midwest weekend at the National Fire Academy. In 1985, the firefighter's association began conducting bingo as a fund raiser to purchase the extra items that the firefighters felt were needed. Jim was known as ï¿½Mr. Bingoï¿½ because he was the primary caller for the five years that bingo was conducted from September through May of each year. Over $80,000 was raised from this venture which purchased our first rescue tool, rescue vehicle, and the first years lease purchase payment for a new 1,800 gallon tanker. The bingo fund raiser ceased when the Kearney Fire & Rescue Protection District was established in August of 1990 that also included the establishment of the ambulance service in Kearney and the hiring of the first three full time personnel. 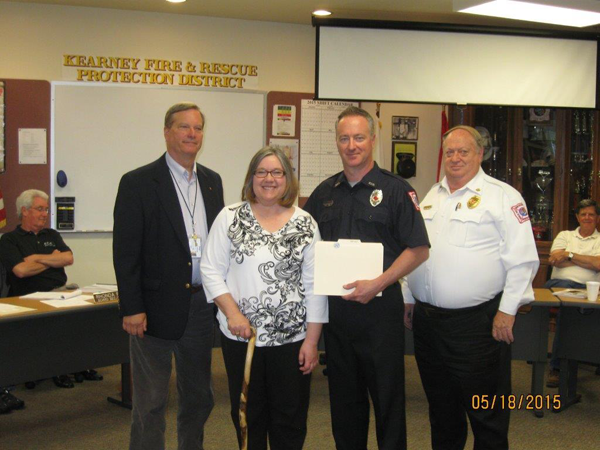 Jim participated on several of the vehicle replacement committees retiring as volunteer Assistant Chief February 1, 2000, with almost 28 years of service. The Fire District Directors, Officers and members would like to offer their condolences to the entire Barger family on his passing. The station flag will fly at half staff until sunset Thursday, January 8, 2015 in his honor. The Kearney Fire & Rescue Protection District is sorry to announce the passing of Kenneth "Drexel" Noble, on Thursday, December 4, 2014. Drexel served as a member of the Kearney Volunteer Fire Department in the 1960's and served as Chief from 1964 through 1966. Drexel was very instrumental in getting the junior fire department established and served as a mentor to many of the young individuals that chose to participate on the fire department. He was also the leading force behind Kearney participating in many of the fire department competitions. Drexel's leadership abilities continued on with his personal life after leaving Kearney working for a construction company and then starting his own. He constructed several buildings here in Kearney and was known for his attention to detail. Our thoughts and prayers for his entire family, his legacy will continue on here for many years. The station flag will fly at half staff on Monday, December 8, 2014 in tribute to Past Chief Drexel Noble. Read more. 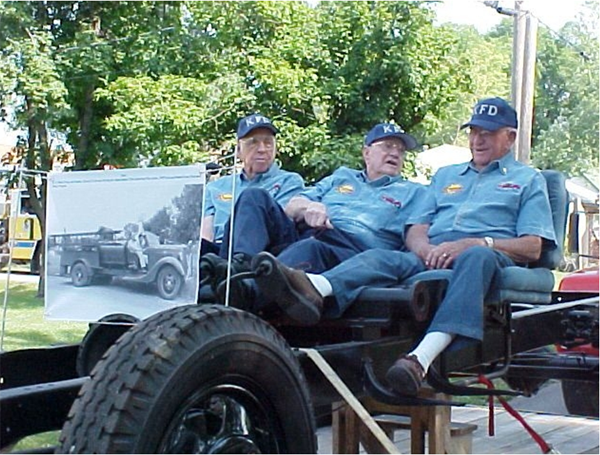 The Kearney Fire & Rescue Protection District is sorry to announce the passing of their last life time member, Darrell L. Cave, who is seated at the right with lifetime members Mike Thompson and Jim Hall during the 2006 City's sesquicentennial parade, on the frame of the City's original fire truck. The 1935 Ford was purchased in January of 1949 from Overland Park and Darrell was the one that actually drove it home. The flag at the station will fly at half mast on Wednesday, April 23rd in honor of Darrell. Read more. The Kearney Fire and Rescue Protection District would like to provide an update on the bond funds that were approved in April of 2010. Click here for details. Click here to view last weeks calls.